Many paths can lead to a job working at a lumber mill, but few people would probably consider working on a commercial fishing boat as something beneficial to their resume. These days he provides training to people running boilers and kilns at other Stimson mills. He’s lead for a crew as well, supervising the lumber drying process, the boiler processes, both day-to-day and long-term, from parts orders to filling in for people on vacation. In addition, he is an Environmental Coordinator, handling DQ and DPA permitted standards for the boiler, as well as stormwater and emissions, where he’s made sure that Stimson has met all the benchmarks for quite a while. “And since my Dad worked for my grandfather part of that time, that makes it three generations of our family working for Stimson,” he added proudly. Stimson Lumber has a long, proud history of its own. Begun in Michigan back in 1850, the company built a state-of-the-art mill in Forest Grove, Oregon, in 1929, just as the Great Depression got underway. Unlike many other lumber companies, though, Stimson Lumber retained all of their personnel, never needing to shut down, even temporarily, or lay off workers. Using innovative ideas, they turned lemons into lemonade following massive wildfires known as the “Tillamook Burn” on their timber stands in the 1930’s and 1940’s by converting burned and green wood that was cracked, stained or of lesser quality into “hardboard.” Their Forest Fiber Products Company, one of the first hardboard operations in the US, began cranking out “sandalwood,” which quickly became the envy of the industry. Continuing to make forward-thinking moves, Stimson acquired Northwest Petrochemical Company in Anacortes, Washington, in 1962 to manufacture phenol for its hardboard processing needs. Other acquisitions beginning in the 1990’s resulted in Stimson operating divisions in eastern Washington, Oregon, Montana, and Idaho. 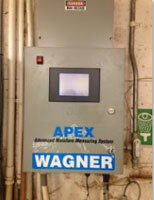 Wagner Apex meters scan each board roughly 90 times, then that amount is averaged out, which makes it more accurate than using a handheld moisture meter alone. “Wagner Meter’s been a pretty good partner with us on the moisture meters over the years,” added Will Reynolds, the Planer Supervisor. In addition to receiving feedback from customers and adhering to their requirements, Stimson Lumber follows even more demanding quality standards. “The WWPA [Western Wood Products Association] requirement for KD [Kiln Dried] or KD-HT [Kiln Dried & Heat Treated] standards for structural-grade lumber is followed in order to produce the best lumber that we can,” Mallery explained. 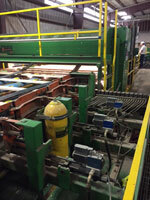 Stimson Lumber continues to look for ways to innovate while producing a quality product more efficiently. They recently purchased new computerized equipment at the Tillamook mill. Besides increasing efficiency in the actual milling of lumber, the new equipment will also increase recovery by as much as 10% and is expected to pay for itself within two years’ time. 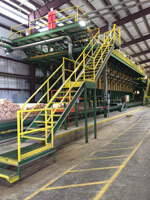 “We have another upgrade planned for November that will be the next phase downstream from the twin bandsaw which should help us be a little faster, more efficient, and produce better quality wood that is in specification more often,” Mallery added. The hope is that by cross-training personnel, workers not normally exposed to the problems faced by another mill might offer useful suggestions on how to improve operations. But it doesn’t just help those other mills. “Eric’s been looking at other mills to see what improvements we can make here, too,” Stockdale confirmed. 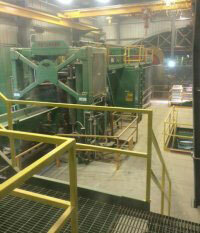 Stimson Lumber’s Tillamook mill has found that Wagner Meters provides them with an edge in producing quality products. If you’ve had similar experiences with Wagner Meters, would you be interested in sharing your story with us? Call us to share your story at 800-634-9961! Learn more about the Omega Moisture Measurement System.